No Need to Sell – Love Your Houses Australia! Once we finished the makeover, people wanted to stay living in their home – now that they liked it! It’s easy to consider selling or moving on when you are fed up looking at rooms that need renovating and improvement. The simplest things can achieve this. Firstly, clean and de-clutter. But don’t panic. This can be done in stages, and is a lot easier than moving. Secondly, Resurfacing your kitchen, main bathroom and ensuite will make your house look like you have a new kitchen and main bathroom and ensuite. Resurfacing needs to be done professionally for quality and durability, so find your Resurfacing Australia Approved member for a quote. Thirdly, a coat of paint. Again, in stages as you can. Painting is a very doable DIY option. Fourthly, carpet and window fittings. Yep, this one will cost a few bones. But for window fittings, you can do these in stages – perhaps as the paint the room, have the new blind, shutter or window fitting installed after painting the window architrave. And carpet, when you’re ready, there are many styles with budget options available. Then, stay in your home because you have made it yours and you love it. No need to sell and lose money selling, buying a new house, moving… only to find all the issues you are going to need to fix in the next house. 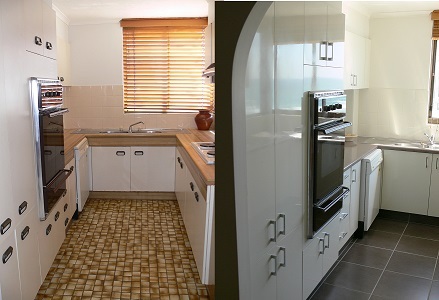 Resurfacing Australia is Australia's leading kitchen and bathroom Resurfacing network.